For two decades, the European Union and western European governments have been providing large budgets to “civil society organizations” for campaigns targeting Israel. Research shows that approximately €100 million ($114,000,000) is transferred annually under frameworks for human rights, development aid, and peace-building to organizations leading the BDS (boycotts, divestment, and sanctions) and lawfare efforts. This policy is a primary example of the use of “soft power” through its NGO dimension in the effort to impose European perceptions, interests, and prescriptions on Israel. This NGO funding is distributed both directly by foreign ministries (including embassies) and aid agencies, and indirectly through government budgets provided to humanitarian organizations, such as Oxfam, Misereor (Germany), Christian Aid (United Kingdom and Ireland), ICCO (the Netherlands), and similar aid subcontractors. In the European Union, the European Instrument for Democracy and Human Rights (EIDHR) is a significant mechanism for funding the NGOs’ leading anti-Israel campaigns. Recipients include highly politicized Palestinian groups, such as Al Haq, Addameer, and PCHR; Israeli groups such as Yesh Din, Adalah, B’tselem, and Breaking the Silence; and allied NGOs based in Europe, such as the Norwegian Refugee Council, Oxfam Novib, and Medical Aid for Palestinians. These groups, working together and in coordination with Palestinian and allied officials, play a central role in organizing boycotts and in leading lawfare campaigns against Israel at the United Nations Human Rights Council, the International Criminal Court (ICC), and similar platforms. Every year, tens of NGO projects funded by Europe are active in campaigns that Israeli leaders, including Prime Minister Benjamin Netanyahu, criticize as designed to interfere with counterterror policies and isolate Israel in the international arena. For example, “Who Profits,” an Israeli NGO that identifies companies for targeting by BDS, is in large part funded by aid mechanisms in Ireland, Sweden, Norway, Germany, and Switzerland. And Breaking the Silence, whose leaders travel the world alleging human rights violations by the IDF, receives two-thirds of its funds from Europe, including direct grants from the European Union. Another example is the network of aid NGOs largely funded by government frameworks which pressed for EU adoption of product labeling (“differentiation”) as an initial step toward official adoption of product boycotts. Although the European Union and individual governments officially oppose boycotts of Israel, these governments are the primary enablers of the BDS movement. In parallel, Europe funds Palestinian NGOs, including Al Haq, Al Mezan, and PCHR that are active in lawfare, pressing for prosecution of Israeli “war crimes” at the United Nations and ICC. Although these Palestinian NGOs do not publish complete financial information, the visible donors are European, and EU diplomats are seen coordinating strategy with these NGOs, particularly at the UN Human Rights Council. The decision-making processes of the various European agencies involved in this NGO funding are highly secretive. Parliaments are not provided with budgetary details, and Freedom of Information requests for relevant documents are routinely denied, citing vague “security issues.” As a result, it is not possible to assess the degree of due diligence exercised by the funding governments, and there are many cases of double-dipping (duplicate funding mechanisms supporting the same NGO). In response to tens of parliamentary and media inquiries, EU and state officials use the standard claim that they fund NGO projects, and not the NGOs themselves – a meaningless distinction as “project” funding goes to salaries, public relations, rent, and social media. Furthermore, most state funders lack the resources to monitor the conduct of their grantees, relying instead on NGO self-reporting, which is highly unreliable. As a result, European funding agencies and officials have been embarrassed by recent revelations concerning uses and abuses of the budgets they have provided to political NGOs. After parliamentary committees in Switzerland, Spain, Denmark, the European Union, and elsewhere received independent reports (provided by NGO Monitor) on their governments’ NGO funding, they forced major policy changes. Four donors to a Ramallah-based “international law” consortium (Denmark, Sweden, Netherlands, and Switzerland) ended the $25 million multi-year NGO budget after learning that substantial amounts went to a number of “highly regarded” Palestinian NGOs affiliated with the PFLP terror organization. Similarly, Spain, the United Kingdom, Norway, and the European Union quietly ended some NGO funding and changed guidelines in response to learning of various abuses, although the damage had already been done. These cases are evidence of due diligence failure accompanying European funding for advocacy NGOs active in the conflict. However, the NGO alliances continue because they give Europe a means of exerting leverage over Israel, thus outweighing other considerations. To understand the unique importance of the NGO dimension in Europe’s troubled relationship with Israel, it is also important to examine structural factors. European funding to selected political advocacy NGOs began after the Oslo agreements between Israel and the PLO in the mid-1990s. The United States had emerged as the primary interlocutor, and Europe – particularly the European Union – sought to prevent an American monopoly and to offset what they saw as U.S. bias toward Israel. This was one of the factors in the European Union’s Barcelona (also known as Euro-Med) project, which provided a large budget and created the frameworks for NGO funding as a form of influence. Most EU member states, as well as non-members Norway and Switzerland, followed by setting up similar NGO alliances and funding frameworks. These frameworks were viewed as core strategic assets, which also explains the high level of secrecy. Although largely ineffective, the original objectives of the NGO support strategy, as perceived more than 20 years ago, continue to dominate the actions of many European officials, including those in the European Union’s External Action Service (EEAS). For the European Union, these carefully selected NGO allies are also sources of information and analysis to make up for the comparatively thin EEAS capacity. Many European Commission documents and statements on the most complex and sensitive topics, such as borders, negotiations, and Jerusalem, contain excerpts from the reports of their NGO allies, including glaring factual errors and ideological spin. This reflects the mutual dependency, which, in the absence of checks and balances, leads to fundamental errors in judgment and adds to the underlying problematic relationship. Based on the Barcelona framework, the European Union became one of three primary funders of the infamous NGO Forum at the UN Durban Conference in 2001, which featured blatant anti-Semitism and launched the BDS movement. While the other core funders – Canada and the Ford Foundation – conducted investigations and took steps to prevent a recurrence, no such review took place in the European Union. For the European Union and at least its western state-members, these NGOs are also the preferred means for attempting to impose favored policies on Israel. 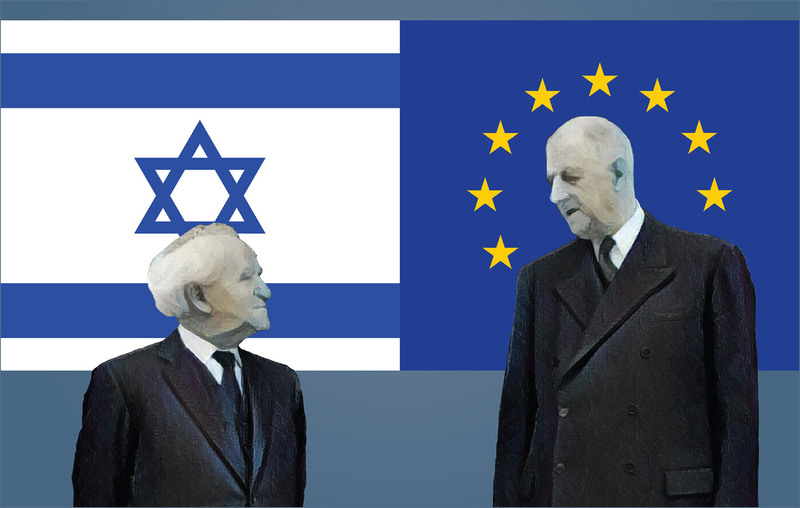 From the 1980 Venice Declaration through the current situation, Europe has sought to impose on Israel the creation of a Palestinian state, based on the pre-1967 armistice lines, as the only “solution” to the conflict. European governments have also stridently opposed Israeli policy in the West Bank and Jerusalem and worked closely with like-minded NGOs to oppose these policies. Over the years, these policies led to considerable and increasing friction with Israel, at different levels. In 2009, the Knesset began discussions that led to foreign funding transparency legislation, in response to European secrecy. Later, draft laws were introduced to label Israeli NGOs funded by Europe as foreign agents. In addition, Prime Minister Netanyahu and other top officials put funding for radical NGOs leading demonization campaigns high on the agenda in meetings with European officials. Netanyahu canceled meetings with German Foreign Minister Sigmar Gabriel over this issue, and Belgian Prime Minister Charles Michel’s embrace of radical Israeli NGOs B’Tselem and Breaking the Silence created a diplomatic incident. In June 2018, Netanyahu reportedly canceled a meeting with the European Union’s Frederica Mogherini, in parallel to the discovery of a new EU NGO project collecting “testimonies” for lawfare cases targeting vital Israeli counterterror operations in the West Bank. For all of these reasons, the European support for radical NGOs that promote the demonization of Israel is a major source of friction in the relationship. Two decades after Europe adopted this approach to Israel, in the shadow of the Oslo process and the Euro-Med framework, a complete review of the unique NGO funding policies as applied to Israel, and their impact, is long overdue.